It is important to understand how H.323 traffic impacts the network and then plan for it. Organizations that do not properly go through this process are often disappointed in the quality of their connections and blame the video conference endpoint, when it is really the network. In today’s post, we’ll examine some other tips to make sure that your network is optimized for video conferencing. One easy system that will make life easier for everyone is to label the ports (Internet jacks) in the classroom so that the teacher knows which one to plug the videoconferencing system into. 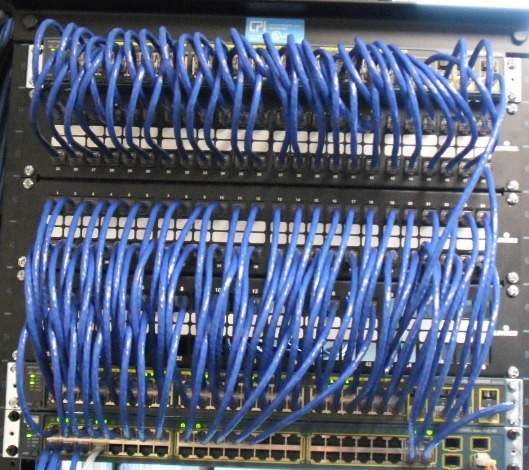 Schools sometimes have jacks that aren’t live, or one of them is specific for the VLAN, or one of them has the special configurations for videoconferencing. Label the one that teachers or videoconference coordinator should use. This will reduce support calls and keep everyone happier! A wired connection is more stable and secure than wireless. You’ll get a better quality videoconference if you use a hard-wired connection to the Internet vs. wireless. Videoconferencing is more sensitive than regular data traffic. So give the best you have so that the end users will find the quality acceptable! If you use wireless, then configure it right! If your wireless connection is configured to be used solely for videoconferencing, then lock it down to the MAC addresses of the videoconference units. If your wireless connection is also used for data, secure it as tight as you can. Avoid scenarios where the other traffic can interfere with the videoconference. Make sure your access points on down through to your switches are configured with the correct variables, i.e. duplexing, line speed, bandwidth restrictions or allows, etc. Work with someone who knows about the technical aspects of videoconferencing. Your usual network support personnel may not be familiar with the intricacies of video. Get the advice of a video conference professional as well! Do you agree or disagree with our tips? Do you have any additional tips to share? We invite your comments and input! One other thing I have learned is to have my tech department move the jack I use for video conferencing to the top of the rack in each school. That provides a better connection, especially when everyone in the school is using their computer at the same time. That’s an interesting tip! Does it somehow give priority? Thanks for sharing!! In our environment, it gives it priority but this may not be true with newer equipment. As explained to me, if the vc drop is moved to the top of the rack, it gets first choice of bandwidth before the computer labs which use great amounts of bandwidth. All I know is, it works! Cool! I love to learn new tips like that!